Once you've signed in to your account, proceed with setting up the phone to use Wi-Fi or mobile networks. Step 1. Turn on or enable Wi-Fi on your device. Step 2. Connect to an available Wi-Fi network. Step 3. Tap on Apps from any Home screen to continue. Step 4. Tap on Settings. Step 5. Scroll down to "Network Connections" option. Step 6. Tap on More networks. Step 7. Slide the Wi-Fi Switch right to the ON position, if it says OFF. Otherwise, do nothing to leave it ON. Step 8. Tap on Wi-Fi Calling to continue. Step 9. Tap to select Connection Preferences. 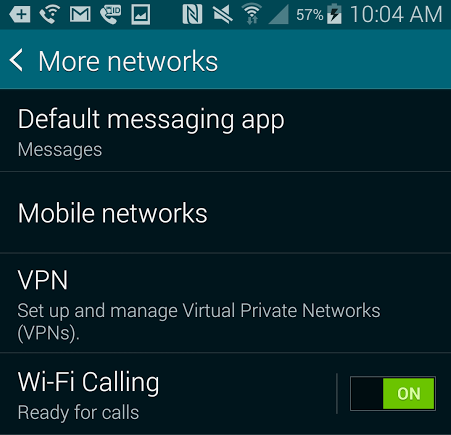 To proceed with using Wi-Fi calling, turn on Wi-Fi and connect to a network on your GS 5, with the following methods. 2. Tap to select Settings to continue. 3. Tap on Wi-Fi under Quick Settings. 4. Tap on the Wi-Fi Switch to turn it ON. Doing so will let the Switch to move right and then turn green. 5. Tap on the Wi-Fi network you preferred to connect to. 6. Enter the correct network password, if prompted. 7. Tap on Connect to proceed. · Tap on the Menu key located in the upper right corner of the screen. · To manually add a network, tap the + sign or Add Wi-Fi network icon. 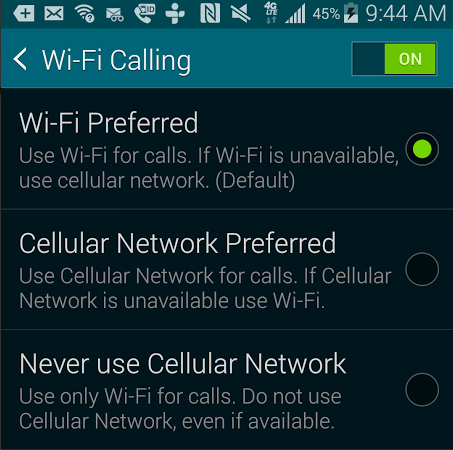 After enabling and connecting to your Wi-Fi network, you may now turn on Wi-Fi calling on your device. 1. Make sure you have successfully registered your 911 address and configured connection preference. 2. Turn on Wi-Fi network and connect to a network. · Tap on Apps from any Home screen. · Scroll down to 'Network Connections' option. · Tap on More networks. · Tap on the Wi-Fi Calling Switch to ON. You will see the Switch moves right and then turns green. · Once Wi-Fi and Wi-Fi Calling are both enabled, you are now ready to use Wi-Fi Calling. In case you encounter any error when using Wi-Fi calling on your Samsung Galaxy S5, please let us know so we can help you find the best possible workarounds to rectify the problem.